Lauren Renner represents much of what’s refreshing and new about business today. At 26, she’s a part of Gen Y, the young people who are seemingly comfortable with all technology, eager to learn from everyone, ready and willing to collaborate with colleagues. 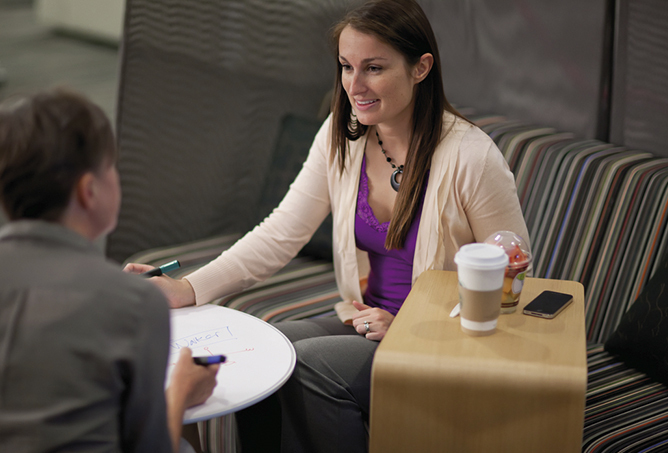 A financial analyst at Steelcase, her career exemplifies how much business has changed. Little more than a generation ago, women mostly held clerical positions. Today they hold over half – 51.5 percent – of management, professional and related occupations according to Catalyst, a nonprofit foundation that advocates for women in business. Renner’s workplace is especially new. Her “office” is a series of workspaces at the Steelcase global headquarters, a work environment of individual and group spaces with flexible furniture and tools that support a range of workstyles, and a palette of place and posture that are essential elements of an interconnected workplace. 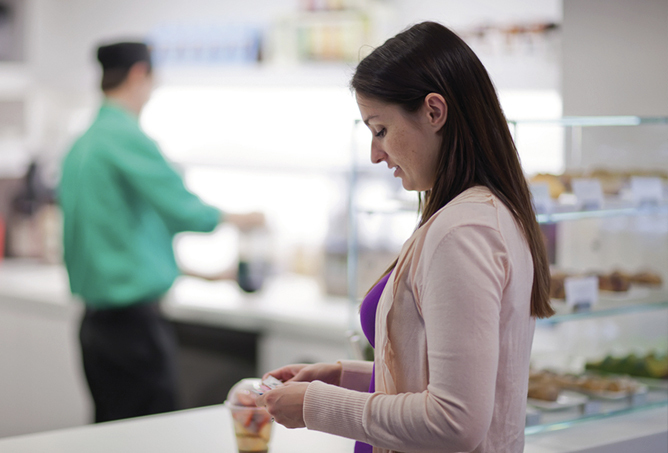 Her typical day starts with a visit to the WorkCafé, an on-site third place for dining and working and where she often has an impromptu meeting with a colleague about a current project. Sometimes she grabs a space to catch up on email, make some calls, write a report. 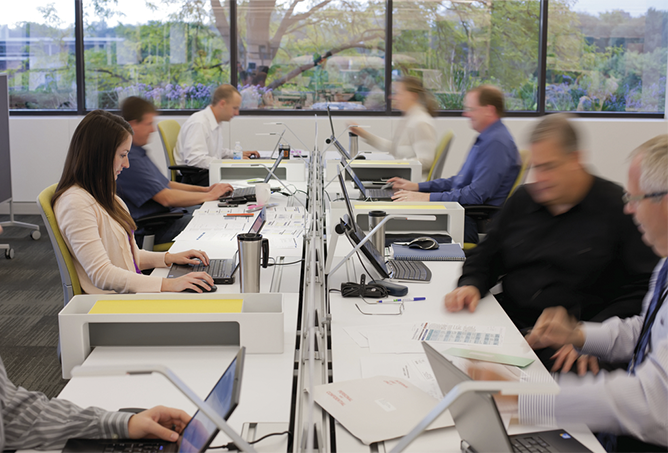 The WorkCafé is purposely designed to support this blend of individual and collaborative work common among mobile workers like Renner. Knowledge work today means frequent collaboration. Renner’s supervisor, Tim Fennema (shown with Lauren above), schedules twice-weekly team updates so everyone stays in touch. Even so, managers must adjust to not having “line of sight” to their direct reports. “You have to trust that, as long as the work gets done, it doesn’t matter if I can see my team at work,” says Fennema. The new work environment for Finance, Quality and Procurement serves the three groups (it used to support just one), as well as visitors from other areas of the company. Most spaces are unassigned and can be used by anyone. Configurations range from wide open to fully enclosed, in sizes right for individuals, and small or large groups. Individual work. 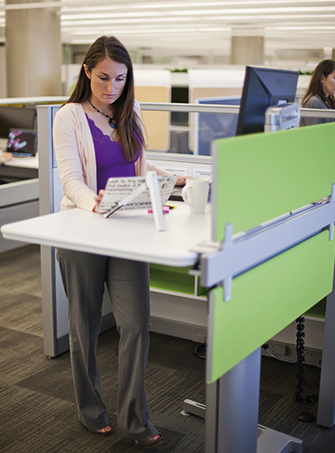 A height-adjustable desk is one option for Renner, who has no assigned workspace. A favorite home base for the day: one of the bench-style workstations in the department’s nomadic camp, spaces available to any worker. Renner’s generation is often reported to prefer working at the local coffee shop, hunched over a keyboard and plugged into an iPod. 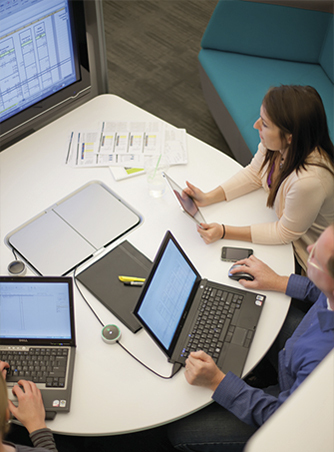 Yet Steelcase research, including recent planning with the people in the Finance, Procurement and Quality departments, show that “a preference for a certain type of workspace varies more by workstyle than by age,” says Julie Barnhart Hoffman, design principal with WorkSpace Futures, the Steelcase research and design group, and principal designer of the new work environment. “There are different workstyles within each generation – Boomers, Gen X and Gen Y. The important thing is not labeling workers by generation. We all need to be able to choose the places we work, the tools we use, what’s best for the work at hand,” she says. Working with colleagues from Brand Team. 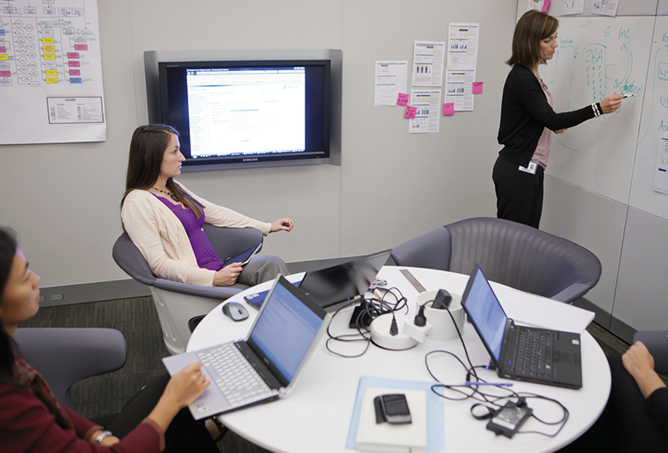 This Collaboration Zone has everything Lauren needs to work through the budget process with the Brand Communications team: display and projection surfaces, data and power access and easily reconfigured tables and chairs. Renner’s colleagues are sometimes located in other countries and telepresence helps bridge the distance. When team members are located in different time zones, a mobile worker’s day often extends beyond normal business hours. She doesn’t have an assigned desk or other traditional totems of corporate success. Instead she has much more choice and control over her work environment than previous generations, as well as better tools to support the ways she works. “I think success today is measured by the work you’re doing and the responsibility you have. It’s not about having your own desk. I’d rather have the ability to choose where and how I work.” For Renner and knowledge workers like her, the new status symbol is the freedom an interconnected workplace provides.